If someone were to ask me, “What’s the stupidest thing you’ve ever done?”, I’d answer with this: trying to be in control. Working on the terminal onc ward is pretty stressful if you’re emotive. People came to our floor because they were going to die. A lot of them were there for a week to receive the next chemo cycle before heading back home. Some of them stayed for longer, months even. But no one ever got so healthy that they left for good. Thankfully, I’m not as emotive as most. You start to get a feel (or think that you do) for how people are doing. Some are feeling so well that they start thinking their cancer may be going away. Others are holding steady with their treatments, walking up the down-escalator. Some are doing horribly but are stably horrible. Those are the ones that are just agonizing to serve. I remember starting on the floor and taking care of the same women for three months. Every two hours, adjust position in bed. Clean as necessary. It was always necessary. I remember a frail patient of mine that was in her seventies. Her family knew that things were worsening and that this weekend would be her last. Everyone from out of town was coming in and spending the full day with her. As a tech, it was always a strange experience entering the room to take vitals or perform a blood sugar test. The family members would watch me so intently and then each advance their chins to me, awaiting the result. “Her blood sugar is 136.” When there is no control, there must be control. Keeping track of BP, HR, and sugar are all our best attempts at control of some kind. The family left for the night. I had ten patients for my census and checked in on her as much as possible. She was heading downhill and her breathing was becoming more and more labored until she started using her accessory muscles to pull in the air. They call this “agonal breathing” which just about hits it on the nose. I stood by her side and waited for the nurse to respond to my page. I didn’t see her do it, but the woman reached out and grabbed my wrist. It was unexpected and cold and it gave me a start. I reflexively pulled away and then felt a heavy embarrassment and sadness for her. I think I reached out to hold her hand. The nurse came in and the two made eye contact. She had such fear and the nurse looked at her and said that it was okay. You’re dying. It wasn’t cruel or improper, but somehow perfect for that moment. She relaxed. There was nothing I could do for her. She was dying in front of me and I would be there for her final new and final final experience. I saw that her lips were cracked. I got some lip balm, held it out, and between gasping breaths she pursed her lips so that I could apply it. That was my stupid attempt at control. I can’t remember if I held her shoulder, or hand, or just stood there doing none of those things. She was staring straight ahead, bracing. And then she stopped. We called the family. They came up the elevators crying at 4 in the morning. They stayed with her until 6 and, before my shift ended at 7:30, I walked into the room. After taking off her gown, I tied her feet together. I tied her wrists together. And just as I had turned her side to side so many times before, I managed her into the big white plastic bag. I wrote her name on a tag and looped it into the zipper. Security came and wheeled her away. Alive, I could do something for this woman. Dead, I could do something for this woman. But dying? They didn’t cover that in training and it seems like something impossible to get entirely right. Even so, when the best you can do is stand in the room and treat cracked lips, it seems especially futile. A new patient with a new cancer and a new family was in the room within the hour. Two years later and I still feel the pang of failing her that day with my stupid attempt at control. Worse, I know that it was one of her last memories. This entry was posted on Saturday, August 12th, 2006 at 11:39 pm and is filed under Best of Medical School, hospital, Med year 02. You can follow any responses to this entry through the RSS 2.0 feed. You can leave a response, or trackback from your own site. Bless your heart. You write really well. What is it with you and middle aged women??? (I just looked at the above comment and blog.) I suppose you must be the “son of our dreams” or something, though I actually have a most excellent son who is about your age. Anyway, more good stuff from you, and apposite, as I am currently watching a 90-year-old uncle die by degrees. I only hope he’s got someone like you nearby when he breathes his last at 4 a.m. Good man, you. Feel free to delete this comment, if two wrinklies in a row embarrasses you. I think what was unfortunate was not your “stupid attempt at control” but a lack of preparation for this moment. Preparation for witnessing and responding to someone’s final momets should be part of your curiculum. But it should also be part of everyone’s everyday knowledge bank. With it you might have felt secure knowing you tried to make her last moments more comfortable. What better act than to be present and to simply respond to what is? 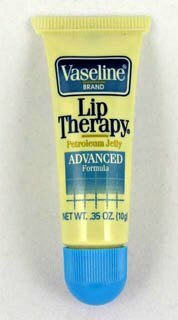 topher, putting on the lip balm wasn’t a “stupid attempt at control.” It was a final act of kindness and tenderness towards someone for whom you couldn’t do anything else. She knew what you were doing and welcomed it: that’s why she pursed her lips. You were ministering to her. What better final memory could she have? Topher, you did the most kind thing possible. When people are dying, they don’t worry about food or fluids or many other things. But one of the things they feel the most is a dry mouth and cracked lips. You did the perfect thing for her, which was soothing to her in her final moments. Even if she remembers it now, she will think of you with fondness. You may have the makings of a fine geriatrician. You were mindful of her care and comfort right up to her last moment. Your ’embarrassment’ is only a misinterpretation of your compassion. If only more of them were like you. First-rate post. You have made a recent devotee. Please keep up the nice posts and I look forward to more of your engrossing posts. Detalii utile. Multumim pt impartasirea lor.